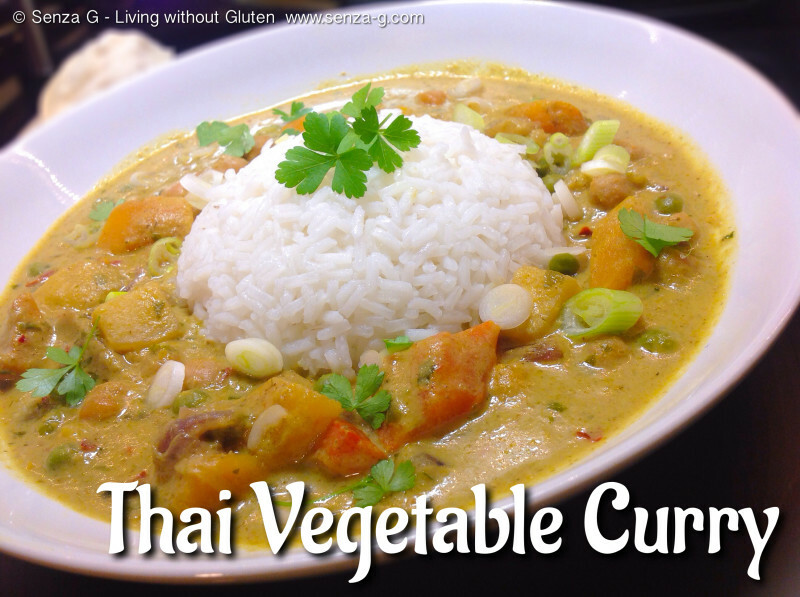 This is a quick and easy Thai Vegetable Curry. It is not authentic in the sense that the curry paste is not made from scratch but is made with commercially manufactured Gluten Free Thai Curry Paste. It is convenient to keep at hand and although it is a cheat’s way, it still tastes just as great – perfect if you are in a hurry! Sauté onion in oil in a pan over high heat until translucent. Add the pumpkin cubes and carrot and cook until the edges are golden. Stir in garlic and curry paste and cook, stirring for about 1 minute. Add the coconut milk, a dash of soy sauce, the water and simmer, covered, stirring occasionally, until pumpkin is tender. Add the peas and simmer until sauce is slightly thickened. Stir in the chopped coriander. Serve with Jasmine Rice, sprinkling with the chopped spring onions and coriander leaves.